A tradition of customer service. Albertina and Manuel Luis founded M. Luis in 1985 based on the principles of hard work, dedication and a commitment to excellence. Over the next two decades they grew the company into a thriving paving and construction services company. In 2008, Cidalia Luis-Akbar and Natalia Luis took over the company’s ownership and management, and grew the company into a multi-division enterprise with a broad range of services to meet their commitment of quality service and excellence. Cidalia and Natalia embody this corporate vision and values, and have never forgotten their roots and heritage, or the values that brought them to where they are today. 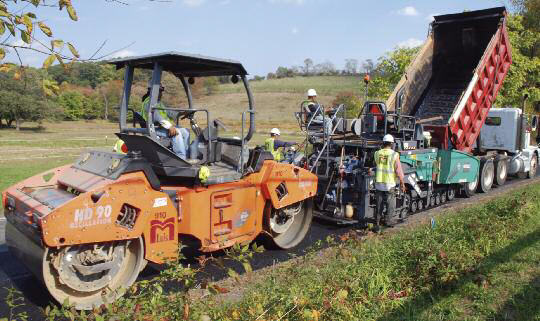 In 2010, M. Luis acquired the easily accessible Rockville, MD asphalt manufacturing facility. The plant is a state-of-the-art, high-production asphalt plant in Montgomery County that has significant local and economic impact on business and employment. The decision to vertically integrate the company with manufacturing allows us to better control the integrity and quality of our products as well as offer a higher level of service to our diverse client base. The venture has been a resounding success. Today, M. Luis is a devoted and trusted partner to federal, state, and municipal agencies as well as commercial and private industry. We serve Maryland, Washington D.C. and Northern Virginia with experienced and highly trained employees, including field technicians to support a wide variety of construction projects. We are committed to quality service, leadership, and excellence in our industry while making a positive contribution to society and the community in which we live and work. Going forward, the company will continue to commit every resource into providing our diverse customer base with the resources and rapid response that enables their success.